The tree is decorated, the presents are wrapped and the mistletoe is ready for action. All that’s left to complete your holiday-ready home is a perfectly festive table setting. Here are a few pattern combinations from Hen House Linens that will have your dinner table looking merry, happy and bright this holiday season. 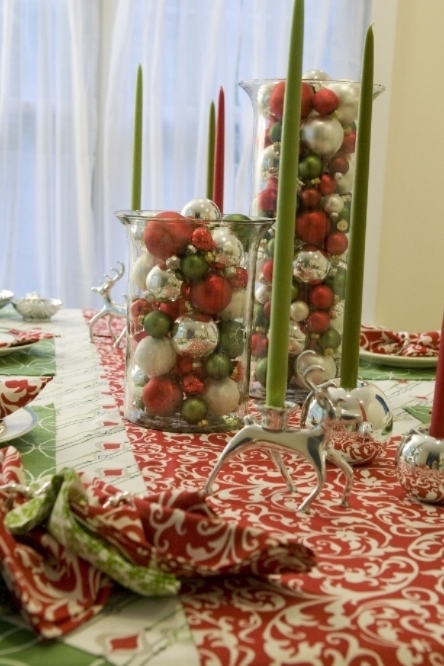 Our Ornamental Scarlet pattern will be a tablecloth staple for your dining room during the holidays. For dinner napkins, try the vibrant green Bargello Grass print to give your setting a pop of joyful color. As a final touch, placemats in Devine Peacock are a simply stunning choice. Nothing says happy holidays like red and green trimmings. Put a festive spin on the traditional color scheme by decorating the table with Ornamental Scarlet dinner napkins paired with quilted round chargers in Devine Scarlet. Set against a timelessly elegant Fleur-de-lis Basil tablecloth, your table will be the ideal gathering spot for your family to spread joy all season long. Ring in the holidays with the versatile combination of Devine Scarlet, Jane’s Mum and Grand Fleur-de-lis Gold. Devine Scarlet and Jane’s Mum are perfect as tablecloths and runners, while the vivid Grand Fleur-de-lis Gold pattern brings just the right touch of bright holiday cheer for a runner or as napkins.